Etna seen from a plane. Mount Etna is a volcano on the east coast of Sicily, part of southern Italy. It is the largest active volcano in Europe. Mount Etna erupts every few years. 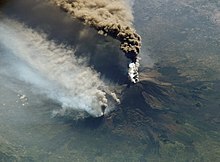 Etna's most destructive eruption in historic times started on 11 March 1669. It produced lava flows that destroyed 10 villages and reached the town of Catania five weeks later, on 15 April. Many buildings were destroyed and few people were killed. Major twentieth century eruptions occurred in 1928, 1949, 1971, 1983 and 1992, as well as the 2001 eruption. In 1971, it buried the Etna Observatory (built in the late 19th century) under lava. The 1992 eruption saw the town of Zafferana threatened by a lava flow, but successful diversion efforts saved the town with the loss of only one building a few hundred metres outside it. In 2002–2003, the biggest series of eruptions for many years threw up a huge column of ash that could easily be seen from space and fell as far away as Libya, on the far side of the Mediterranean Sea. Seismic activity in this eruption caused the eastern flanks of the volcano to slip by up to two metres, and many houses on the flanks of the volcano were damaged. The eruption also completely destroyed the Rifugio Sapienza, on the southern flank of the volcano. This page was last changed on 24 February 2019, at 20:41.